"Having had such an enriching time at Oxford Brookes... it seemed like a natural progression to maintain the connection." It was recommended by the Principal of the College where I did my A-Levels. After finding out more, what appealed to me was the Modular program, which allowed me to study Law and Business Administration. There are many but the most memorable are the excellent lecturers, tutors, personal tutor, staff of the university and the friendships that were formed with individuals from across the globe. The people, both staff and students. Having studied Law, I spent nine months in London to pursue the Bar Finals. After that I returned to Malaysia and kick started working life. Were you involved in any extra student activities whilst abroad? At Brookes I was involved in the Law Society, International Society and formed the Malaysian Society. I also developed a passion for playing squash. My career has evolved from being a Counsellor at a Private College, to being in Marketing, Promotions & Public Relations, Customer Service, Commercial and Cylinder Management, Special Projects, In-house Trainer, Corporate Communications & CSR and now Corporate Affairs. I have enjoyed each role in the span of my working life to date, as each has given me the width and depth of different industries (I have never worked in the same industry twice – Education, Theme Park, Banking, Fast Moving Consumer Goods, Industrial Gases and Paint Manufacturing) and an opportunity to explore and discover my strengths and where my passions lie. My various roles has also allowed me to work with a variety of individuals of different ages and experience. They have a played a large role in my career growth and development. Did attending an international university benefit you professionally /personally/ academically? Yes it did. Having studied abroad taught me to be independent and take personal accountability for decisions and actions. The opportunity to have course mates and friends from across the globe also provided enriching insights about other cultures. One of the main discoveries I made was that we all have similar cultures. I learnt and hold this value today, in that we are human first and foremost. Everything else is secondary. For me, having had such an enriching time at Oxford Brookes, as a whole, it seemed like a natural progression to maintain the connection not only with alumnus but also with Oxford Brookes. 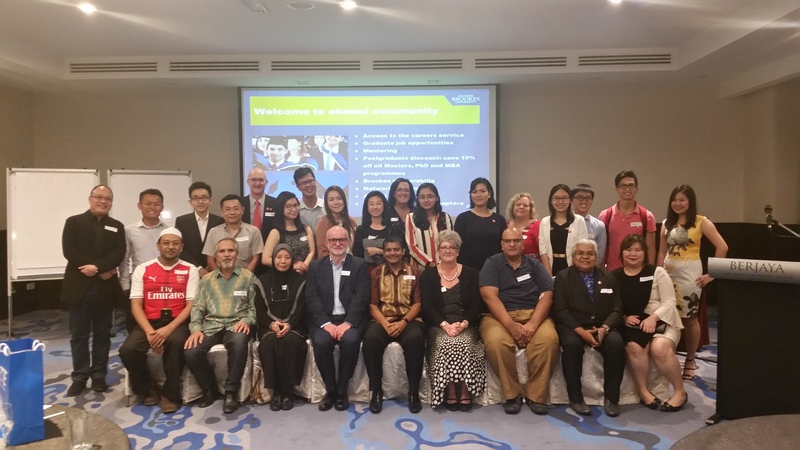 International alumni event hosted in Malaysia, November 2017. Immerse yourself not only academically but also partake in the enriching experience of being amongst such a diverse group of students from all over the world. Engage with your lectures, tutors, personal tutor and staff of the University. They are there to support you. Please connect with the Alumni Chapter, if there is one, in their respective countries. If they do not, keep in touch with the Alumni Office at Oxford Brookes.